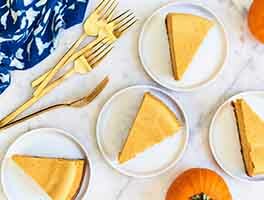 Pistachio and orange complement each other beautifully in this unusual cake, with its nutty, orange-infused crust and creamy pistachio-flavored cheesecake filling. 1 hrs 5 mins. to 1 hrs 10 mins. Preheat the oven to 375°F. Lightly grease a 9" or 10" springform pan. To make the crust: Place 1/2 cup of the flour, all the sugar, and the pistachios in the bowl of your food processor. Grind until the nuts are very fine. Transfer the mixture to a large mixing bowl and add the salt, the rest of the flour, and the softened butter. Mix with a paddle until the mixture looks crumbly, then beat in the orange zest and egg. Press the dough evenly across the bottom and 1" up the sides of the prepared pan. Chill the dough for 10 minutes, then prick it all over with a fork and bake for 20 minutes, until golden brown. Remove from the oven and cool to room temperature. Reduce the oven temperature to 325°F. To make the filling: Place the cream cheese, sugar, and flour in the bowl of a stand mixer fitted with a paddle. Run the mixer at low speed until no lumps remain, about 4 minutes. Scrape the bowl and mix in the orange zest, salt, vanilla, and 1 egg. Scrape the bowl and add the rest of the eggs, one at a time, waiting until each egg is fully incorporated before adding the next. Mix in the sour cream and orange juice. Measure out 1 1/4 cups of the batter and set aside. Pour the rest into the pan over the cooled crust. In a medium heatproof bowl, heat the pistachio paste with the water for 1 minute at half power in the microwave; stir to soften it and remove as many lumps as you can. Add half of the reserved filling and mix until smooth. Add the remaining reserved filling and mix completely. Add the pistachio batter to the orange batter and mix until smooth for a uniform effect. 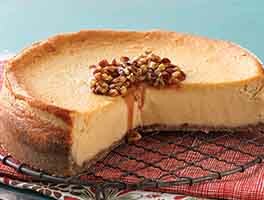 Alternately, you can drop the pistachio batter by the tablespoonful in a ring around the cheesecake about 1" in from the edge, and swirl with a table knife for a decorative touch. 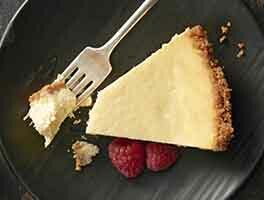 Bake the cheesecake for 45 to 50 minutes, until the edge of the cake is set 1" in from the edge. The middle should still jiggle when you nudge the pan; the center will look underbaked. Turn off the oven and prop open the door. Set a timer for 1 hour. The cheesecake will slowly finish cooking during this time. 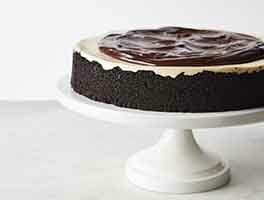 After 1 hour, take the cake out of the oven, cool to room temperature, and refrigerate until ready to serve. Before serving, decorate the top with chopped pistachio nuts and orange slices or candied orange peel. I made this for my family's Easter brunch, and it was a refreshing departure from the typical heavy cheesecake! The flavors were bright and springy, and the pistachio paste made all the difference. I'm used to baking cheesecakes in a water bath, but the texture did not suffer at all with this method. This is a simple recipe for a sophisticated dessert, and if you can shop around for the pistachio paste, it's definitely worth a try! 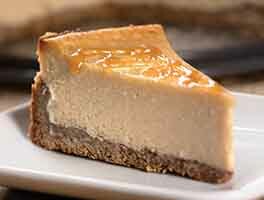 This is the tastiest cheesecake on earth. It tastes so good, it's so creamy, so easy to make, and the flavors really wow.